Thanks for sharing all your Halloween nails and costumes with me! I really didn't see many people dressed up this year. So many of the kids out trick or treating didn't even have a costume, they just wore their regular clothes. Boo! I ended up as a glow in the dark skeleton with blacklight reactive eyes. Nothing super fancy, but everyone I saw complimented my on my eyes! One thing I should probably mention: The Kryolan UV colors are special effects makeup and are probably not eye safe. It doesn't mention it anywhere on the packaging or on the Kryolan website, but most neons are not approved for use in the eye area, so I'm going to assume that these are in that category. This is the first time I've used the Revlon Blue Shadow lashes and I really, really liked them. Revlon sent me a few styles to review a couple years back and among them was a pair of Blue Shadow lashes that I had not tried until now. The Blue Shadow style is, for me at least, the easiest to use and most flattering Revlon lash of them all. Don't know why I waited so long to try them on. It's just a little accent lash that flares out slightly. A few of the lash strands are blue so they add just a little tiny subtle flash of color. I could easily wear these all the time... They're just so pretty and they don't give me any trouble at all. Love them. The lips I did to go with this were Obsessive Compulsive Cosmetics Lip Tar in Botanical with Traffic right in the center of the lips to make a little yellow-green gradient. So, anyway, that was my Halloween look. Nails were still the Incoco pumpkins and I'm going to leave them on as long as I possibly can. So sad that October is over, I need some pumpkins on my nails for just a little while longer. Wow! No wonder you had lots of compliments. It's gorgeous! i love green! this looks so great! 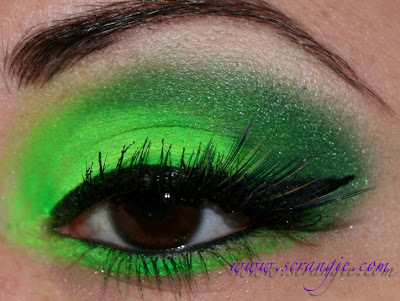 HOLY MOLY that is beyond Freaking Amazing, I'm always so jealous of your eye looks!! I wanna see your whole face! Your eyes are very pretty, and so is the makeup. I love that bright green! Looks super!!! For whatever reason, they're not eye safe in the US - England and other countries in Europe allow blacklight-reactive eyeshadows. Sleek has an eye palette with neons that, right on their website, they say they will not ship to the US. Wow! Love how vivid that green eye look is. You always do the best looks and rock it! The green gradient look is amazing! 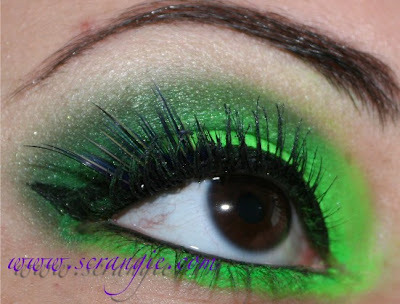 Absolutely love it, and the lashes are stunning as well. WOW!!!!! This is one of the best halloween makeup looks I've seen! It's so vibrant! your eye make up is really pretty and clean! That's some amazing eye makeup. It's stunning. Love those lashes also. Would've loved to seen the complete look. this is electrifying my excitement! very bright and pretty! !